Question: “Hi Martin, I’m bringing a mare I bought a couple years ago into more work. She’s a QH/Arab cross. Her history: She is a kind, gentle mare, 12 years, was previously ridden by a youth, has done sporting, hacking and some jumping, had 2 foals. Unfortunately, she had one bad foot injury just after I bought, so I gave her a year off to heal. She’s now 100 % sound and ready for work. Walk is great– she’ll step out at the walk all day. But the trot is awful and hard work. I can get her moving well in the round pen, but she always wants to break to the canter. I have to pull and release to keep her in the trot. Initially, her head was either going up or behind to evade the bit. She has gone from totally soft on the bit, to evading it and wanting to break to canter in the trot. One afternoon, my my husband rode her and did transitions– walk to trot and back down. It seemed to improve. However, now her head is almost on the ground. At the trot, she puts her head right down, evades the bit, but keeps trotting, still occasionally wants to break. Martin: “Eliminate the cause, the problem goes away. That is the short answer. I find rather than looking at the symptoms to determine our problem, I look for the cause. What happens before it happens, why is she she doing what she does? If she is comfortable in the walk and not in the trot, what changes in you? This is the first place I would look. 1) Does she know her job? It sounds like you can get her to trot, she’s just confused on how it is supposed to be. If she didn’t take the trot at all from a walk or a canter that would be a different issue. 2) Is she in motivated and willing? Again, it sounds more like confusion. She isn’t lazy and swishing her tail or won’t leave the walk, and she’s not running off. You’re still able to get her to slow down. 3) Are we in their way? This is the last thing I point out to people but it’s the first thing I look at when I’m diagnosing an issue with a horse. Two things that cause a horse to accelerate without us asking them to. 1. Stored energy, this is like the kid that has too much sugar, the chemistry is not right and they have to move to burn up the stored energy. 2. Nervous energy, or anxiety, this is caused by us creating confusion by sending mixed signals that the horse has trouble separating. Quite often in the situation that you have described, the person anticipates the horse is going to speed up and they lighten their seat bones by leaning forward which makes it easier for the horse to move. The lighter we ride the easier the horse can move, the heavier we ride the more work it is for the horse to move. If we bring our shoulders back and put more weight on our tailbone, and raise our knees to where we’re barely touching the stirrups, we are heavier on the horse. Think about a limber child that doesn’t want to go with us– they’re harder to pick up. If we lighten our seat bones and put more weight on our thighs and stirrups, it makes it easier for the horse to move, just like the child that has a lot of spring in their body when we go to pick them up. 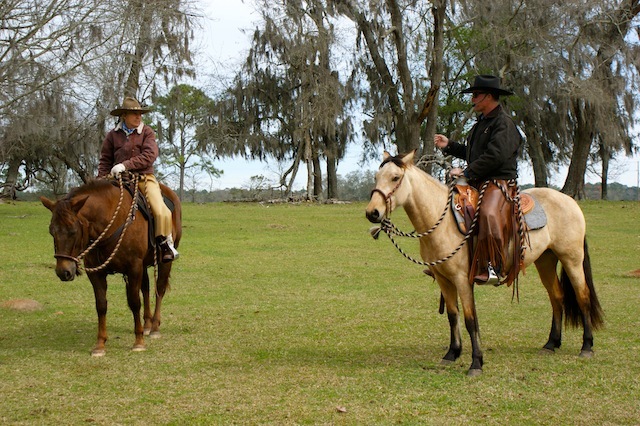 If your body position and energy is telling the horse one thing and your hands (through the bit) are telling her another thing, it is going to cause some confusion. It sounds like she is acknowledging and responding to the bit, just not in the way that you intend for her to. So what is she acknowledging and responding to to bring the energy up? That is what we need to find out. If she was good with your husband and she’s good in the walk with you, there is something changing, something different in the message she’s getting from you in the trot. That’s what we need to find and eliminate. Eliminate the cause, the problem goes away.